Every team in the SEC is formidable. That’s why it’s the premiere collegiate baseball league by far. Every team in the SEC is formidable. That’s why it’s the premiere collegiate baseball league by far. Auburn comes into this weekend at Olsen Field ranked No. 22, and there’s a lot of talent relatively speaking. But with all of those caveats out of the way, the overall record and statisical numbers just aren’t overly impressive, frankly speaking. If you look at Auburn’s non-conference schedule, they didn’t play a ranked team in a weekend series and the competition was marginal at best. In SEC play, Auburn has gone 5-1 against SEC east opponents Tennessee and South Carolina, who are near the bottom of the standings with a combined 8-18 record. Auburn has played two ranked teams from the west division (Arkansas, MSU) and finished 2-4, losing both series. As a team, Auburn is hitting at a paltry .267 which is only two points higher than Texas A&M’s much maligned offense (.265). We’ve discussed A&M’s lack of power with a SEC low 20 home runs. Well, Auburn has hit just 23. The Aggies have actially scored more runs per game (6.34 runs) compared to Auburn’s 6.12 runs per contest. The Tigers have also struck out 260 times this season compared to 221 strikeouts by the Aggies. Auburn does have some speed on the bases, having swiped 48 bases in 2019 (A&M: 30). So the Tigers have a slight advantage over Texas A&M in most offensive categories, but that difference is much tighter than the previous four SEC teams the Aggies have played. The leading hitter by average is Conor Davis at .308 with a .453 slugging percentage. The leading run producer and most dangerous hitter in the Tigers batting order is Edouard Julien, hiting .288 with seven home runs, 32 RBI, and a team high slugging percentage of .542. Kason Heard brings some pressure on the basepaths, hitting .298 with 12 stolen bases. Overall, those are solid numbers, but nothing that should scare the Texas A&M pitching staff. And the same can be said of the Auburn pitching staff as a whole. The team’s 3.94 ERA is more than a point higher than Texas A&M’s 2.90. With a team strikeout total of 307 and 138 walks allowed, the Tigers’ WHIP of 1.34 is higher than Texas A&M’s 1.14 WHIP (397 K’s, 103 BB’s). So this should be an easy series for the Aggies to win, right? Well, not so fast. 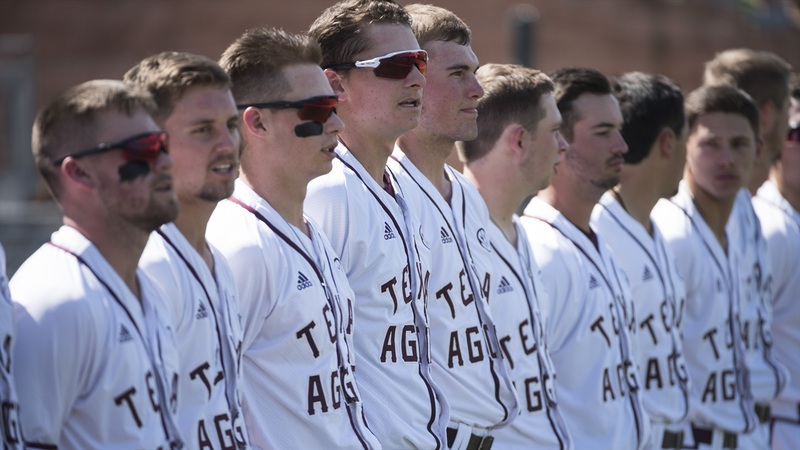 While the overall numbers on the mound significantly favor Texas A&M, the Aggies have a huge challenge to open the series in the all-impotant Friday night opener. Tanner Burns is one of the best starting pitchers in the SEC (and the nation). The right-hander is a perfect 4-0 with a 1.76 ERA and has a stingy WHIP of 0.84. Even more impressive is that Auburn has not lost a weekend series opener this season (8-0). That includes a win on the road at a raucous Dudy Noble Field against Mississippi State and a win over Arkansas last weekend at home. Burns doesn’t lose often, and he hasn’t lost in 2019. If he shuts down the Aggie bats and walks out with Auburn’s ninth straight Friday win, Texas A&M will be scrambling to win the home series given the uncertainty in the Sunday starter spot. The Aggie offense will have a chance to get back on track if they can get past Auburn Friday starter Tanner Burns. Auburn has not announced a starter for Saturday but will go with freshman Richard Fitts (2-1, 4.84 ERA) on Sunday. The designated closer is Cody Greenhill with seven saves and a 3.08 ERA. Again, those are solid numbers but by no means dominant numbers for a closer. Depth in pitching is a big question mark with Auburn which is why they are holding off on naming a Saturday starter until they know what arms are available after Friday’s contest. Defensively, Auburn is fielding at a .971 clip, which is in the bottom tier of SEC teams and one point below Texas A&M’s .972. Those fielding numbers aren’t poor by collegiate baseball standards (.970 is considered the bare minimum acceptable level), but they aren’t very good either. Teams at this level shoot for .975 to .980. We can keep harping on the offense and that certain guys need to step-up and hit better, but after two-thirds of the way through the regular season, you hope for the best and expect the performances we’ve seen through the first eight weeks of the season. For the Aggies offensively, they just need to get healthy. It’s not that Ty Coleman or Cam Blake are hitting the cover off the ball, but they are producing at a much higher rate than their back-ups. The offense does suffer when these guys are not in the lineup. Fortunately, from all indications, there is optimism that both could be back in action this weekend. If not, I have a hard time seeing the lineup generating much offense against Burns. That leads to be the biggest storyline of the weekend and that’s the huge battle between aces John Doxakis and Tanner Burns. Doxakis has been good in recent weeks, but not dominant. He’ll need to be dominant and match Burns pitch-for-pitch. Doxakis has to work under the assumption that he must limit Auburn to no more than a couple of runs, and that means he has to be sharper tonight than he’s been in recent weeks. His ability to grind out a good start won’t be enough. He needs to get ahead in the count consistently and limit his pitch count. While the Aggies’ bullpen has been money so far this season, it would be nice to see Doxakis get through seven innings and turn over a lead to Bryce Miller for an inning and Kasey Kalich to close it out in the 9th. Thus, both would be available for duty on Saturday as well. If the Aggies were to find a way to win tonight, the table is set for a potential sweep. Mentally, Auburn will take a big hit if Burns loses tonight because they’ve counted on him every series to get a win. Asa Lacy has been dominant throughout the season, and is one of the best strikeout pitchers in college baseball. Second, Auburn has not been very successful in the last two games of a weekend series (3-5 record). Add in the fact the Tigers will be facing the best strikeout pitcher in the SEC in Asa Lacy, and Auburn will see the uphill struggle this weekend if they lose on Friday. And it’s not just Lacy on Saturday – Texas A&M has a big advantage on the mound after Burns, and Auburn knows that too. For the Aggies, they need to play clean baseball and not allow Auburn to score any “cheap” unearned runs. Finally, somebody needs to step into the Sunday starter role and provide a solid outing. Christian Roa pitched an inning on Tuesday. Will he be ready, and more importantly, will he be effective after shutting it down a couple of weeks? Does Moo Menefee get another shot at the starter’s spot? He’ll have to erase a nightmare outing in Baton Rouge last week. Do you go back to the veteran Chandler Jozwiak who wasn’t effective last weekend in the Sunday starter role? If the Aggies can answer that question, then winning the series looks very attainable. Again, we’re in the heart of the SEC campaign and it’s all about survival. Teams feel they must win every home series and at a minimum avoid the sweep on the road. From there, you try to get a sweep or two at home and then steal a couple of series wins on the road. So with A&M looking to have the advantage on paper and with the series at the friendly confines of Olsen Field, the Aggies really must win this series against a good (but not great) Auburn team. If the team can find a way to squeak out a win tonight against Tanner Burns, then the goal should be to twist the dagger and finish off the Tigers with a sweep. Between the Auburn series this weekend and the road series at the struggling Gamecocks next weekend, the Aggies need to make some hay and collect wins because road series with Mississippi State and Ole Miss loom on the horizon. Texas A&M can’t go into that difficult stretch at 10-7-1 if they want to compete for a title. They need to 11-6-1 and preferrably 12-5-1 after these next two weekends. That means going 4-2 at a minimum with the goal being 5-1. A sweep would work very well this weekend, and a series win is needed. Great stuff Gabe and Company, btho Auburn!